Using a unique ultra-fast spectroscopic technique, Université de Fribourg and EPFL scientists have now been able to track the fate of charged pairs in an advanced type of solar cells currently under intense research. There has been long-standing debate on how free charges are generated in donor:acceptor blends that are used in organic solar cells, and which are generally comprised of a complex phase morphology, where intermixed and neat phases of the donor and acceptor material co-exist. Here Natalie Banerji at the Université de Fribourg, Jacques Moser at the EPFL, and co-workers resolve this question, basing our conclusions on Stark effect spectroscopy data obtained in the absence and presence of externally applied electric fields. Reconciling opposing views found in literature, the researchers unambiguously demonstrate that the fate of photogenerated electron–hole pairs—whether they will dissociate to free charges or geminately recombine—is determined at ultrafast times, despite the fact that their actual spatial separation can be much slower. The new insights are important to further develop rational approaches towards material design and processing of organic solar cells, assisting to realize their purported promise as lead-free, third-generation energy technology that can reach efficiencies over 10%. The research relies on the optical probing of the effective electric field experienced by a material. An external field is applied to the device and affects the absorption spectrum of materials that make up its photoactive layer. The effect is known as "electroabsorption" or the "Stark effect." 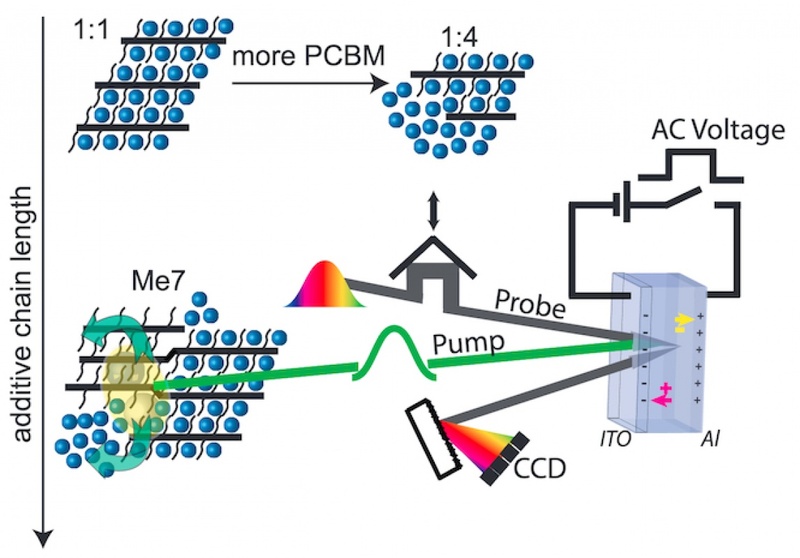 An ultrashort laser pulse then generates charges. These begin to separate, inducing a counter electrical field that opposes the externally applied one. As a result, a decrease of the amplitude of the electroabsorption signal can be detected in real time with pico- to femto-second resolution. The data from the study create a better understanding of the mechanisms of light-induced charge separation in this type of photovoltaics, as well as of the effect of the morphology of the polymer:fullerene blend, which is necessary for designing more efficient solar energy converters. Figure 1. Top and left: Schematic representation of three of the four investigated phase morphologies of the pBTTT:PCBM blends: fully intercalated (1:1 weight ratio); fully intercalated with neat PCBM clusters (1:4 weight ratio); partially intercalated (1:1 weight ratio processed with Me 7). Lower right: Schematic representation of the set-up used for time-resolved EDA spectroscopy on full solar cell devices under reverse bias. ScienceDaily: "A new technique opens up advanced solar cells"
Eurekalert: "A new technique opens up advanced solar cells"
AZO Materials: "EPFL Scientists Make Breakthrough in Cutting-Edge Solar Cells"
R&D Magazine: "New Technique Opens up Advanced Solar Cells"